MBOSE SSLC and Class 12 (Arts) results 2018: The results of both SSLC Class 10th and Class 12 Arts examinations for the academic year 2017-18 has been announced by the Meghalaya Board of School Education today, May 25, 2018. As per reports, the results is soon going to be uploaded on the official website of the Board at mbose.in and megresults.nic.in. 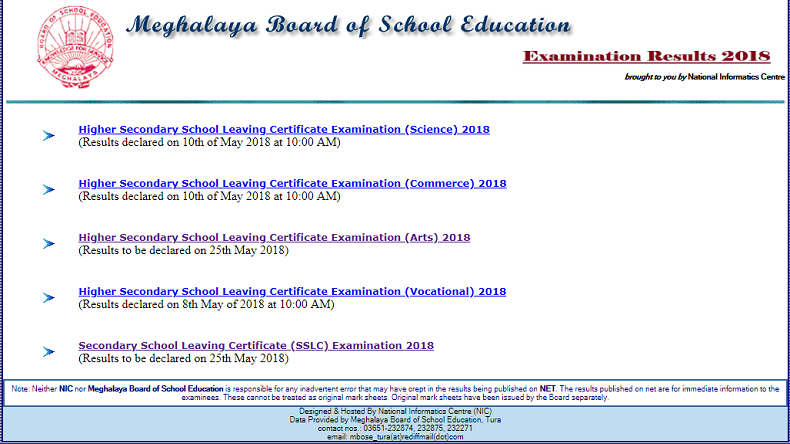 Students who had appeared and are eagerly waiting for their results can check the official website and also other websites such as examresults.net/meghalaya, indiaresults.com to download the results with the help of the steps given below. The Board has earlier released the Class 12 or HSSLC results for Science, Commerce and Vocational stream examination on May 10, 2018. The examination was conducted by the MBOSE from March 7, 2018 which concluded on March 19, 2018. The results for Class 1o last year was released on May 23. Moreover, to access this years results, that have been released now, students have to enter their roll numbers in the space provided on the official website of the Board. In case students are not able to get access to the official page due to the heavy traffic, they can use alternative websites and opt to get results via SMS or use the results application on their mobile phones.